We offer a wide range of high quality services, backed by our ample professional experience in translations, official (sworn) translations, simultaneous interpreting, consecutive interpreting, liaison interpreting, translation and voice-to-text transcription of audiovisual material and website translation. Whatever the technical difficulty or content of your documents, we will take care of it. We have over 10 years’ experience and thousands of specialized translations in economics and finance, commerce, corporate, legal (contracts, patents, court), engineering, industrial, transport, energy, manufacturing, bank and investments, medicine, media, information technologies, telecommunications, international institutions, agriculture, aeronautics, personal certificates and others. 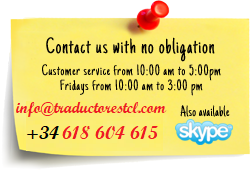 Ask us for a no-obligation and free estimate for your translation. Introducing our new translation categories, two different choices for our usual work: choose the service that best suits your needs! Thank you TCL, you certainly do a very professional and speedy job's a true luxury.